Did you join the Empire after April 15th? You missed the deal of the century: The Ultimate Leaders Upgrade. This package of in-game benefits supercharges your game and lets you network with top players in Empire.Kred and around the web. Plus, you'll get everything you need to build YOUR social media empire. I, Sir Rudiger, love a deal. Right now the ULTIMATE LEADERS UPGRADE is on sale.You get over $2,000 of in-game benefits for up to 95% off. Let's face it, you probably spend more for one night out than you'll spend for this entire package of game benefits that will help you every single time you log in. Leaders is accepting members for a limited time -- so whether you just joined, or missed the last sale, NOW IS THE TIME to give your game a powerful boost. 2) THE NETWORKING. I call it #LEADERPOWER. We all earn double dividends on each other's stock, so we're naturally inclined to help every leader succeed. Some say it's like the early days. 4) THE MISSION BONUSES. As a leader, you get a bonus on every mission run by another leader - and they get a mission on yours. You know what that means? Yup. Leaders do each other's missions first. Other communities do the same thing, but leaders include some of the top players in the game. 7) THE LEADER SHOP. Leaders enjoy sale prices on just about everything during flash sales. That means you get $2,000 in benefits today PLUS you'll save on every item moving forward. (Just last week eaves were on sale for 5 million for just $15. Snooze you lose.) It's an incredible opportunity to up your game. 8) EVEN MORE DESSERTS. You'll get 500 when you join, sometimes get them as gifts, and can always pick them up at a big discount in the Leader Shop. These let you buy a bonus 200 in your favorite player's stock. 9) MILESTONE REWARDS. Your leader benefits don't stop when you join. When leaders hit 1,100 members, we ALL get rewarded! Prizes aren't announced yet... past milestones have included eaves, Even More Desserts, quadruple dividends, portfolio upgrades and more. Empire.Kred's new owners have staff and programmers to do the heavy lifting, but leaders provide feedback and have the opportunity to suggest, organize, or even manage events. Volunteer with fellow leaders to keep the fun going - and forge deeper connections, too. This takes you to a pre-sale blog, so ignore the deadlines and references to Empire Avenue. The Empire.Kred package is the exact same package they are raving about -- and you can buy it right now. We don't know how long it will stay on sale, so buy the Ultimate Leaders Upgrade today. One more reason to buy right now? 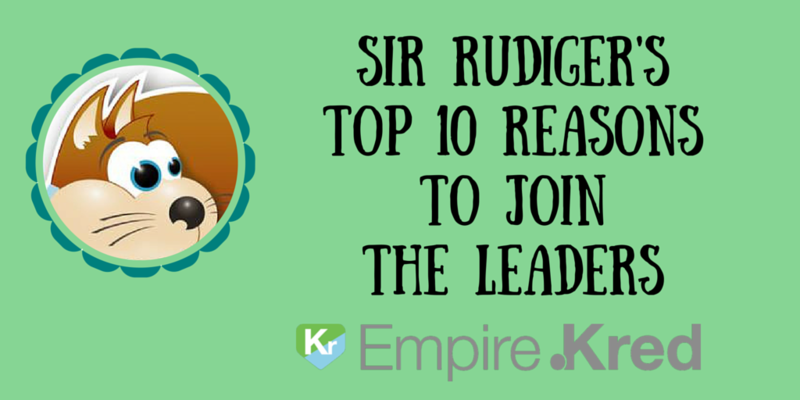 (e)EKLEADERS and I, Sir Rudiger, are running BIG investment missions for the next 10 players who join. HURRY!